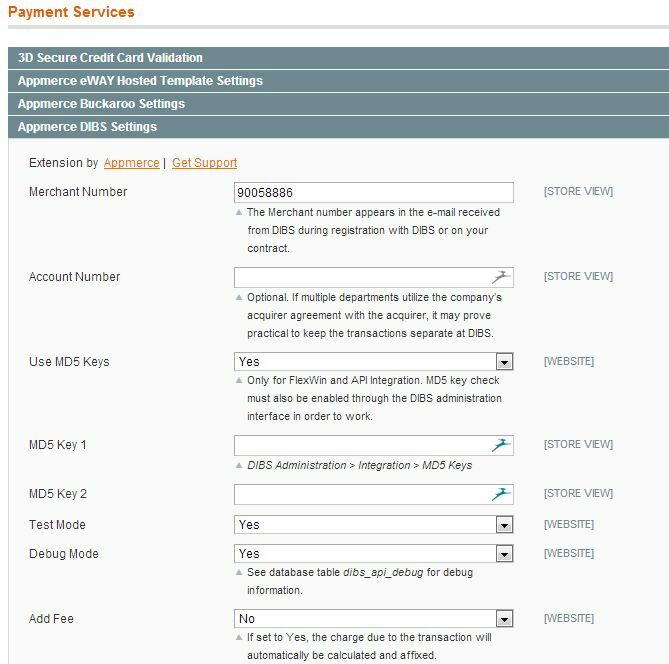 This is the installation and configuration manual regarding the DIBS Online Payment Services extension for Magento Commerce 1.x/2.x. This manual supports DIBS Payment Windows (PayWin), DIBS Flexwin and the DIBS Integration API (which requires PCI certification). 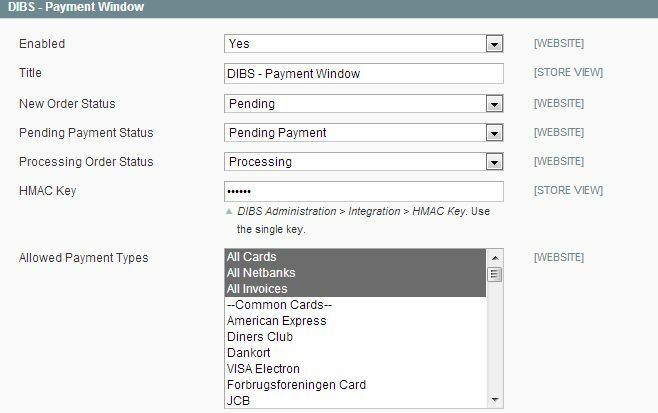 DIBS offers a single administration interface where you can manage each payment method (Payment Window, Flexwin and API). Go to Integration > Shop IP and enter the server's IP address. If you want to find out what your server IP address is, you can use a 'ping command'. 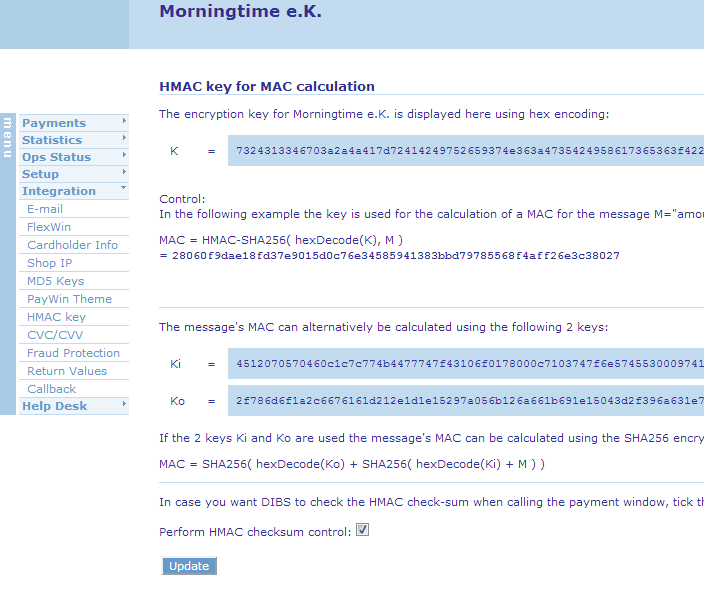 If you want to use the Payment Window method, then you need to enable the HMAC key. In the DIBS administration go to Integration > HMAC Key and check the box 'Perform HMAC checksum control'. Copy the single 'K' key which you need to paste into Magento later. Go to Integration > MD5 Keys. Make a note of the two MD5 keys, because you need to enter them in the Magento configuration later. If you wish to use the API Integration method, then you must create an API user. Go to Setup > User Setup and select the tab 'API users'. Click 'Create new login' and walk through the steps. Remember the Login and the password. You need to enter this information in Magento later. Enter the Merchant Number. This is the login code you use to login to the DIBS admin. It was sent to you in the first email by DIBS. Enter an optional Account Number. Choose to use the MD5 Keys. This is highly recommend, but make sure to also enable this feature in the DIBS administration. 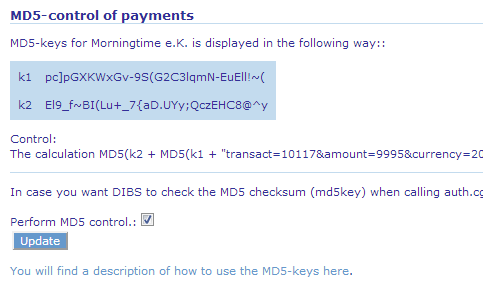 Paste the two MD5 keys in MD5 Key 1 and MD5 Key 2. Enable the Test Mode for testing. You can enable Add Fee to add the DIBS cost to the customer transaction. You can enable this method via System > Configuration > Payment Methods > DIBS Payment Window. Make sure to paste the HMAC Key and select your Allowed Payment Types (this depends on your DIBS suscription). Set the desired order statuses. You can add your own statuses through System > Order Statuses. You can enable this method via System > Configuration > Payment Methods > DIBS Flexwin. Enable Unique Order ID if you want to block duplicate payment requests. You can enable Complex Order Information if you want to submit the line items (all products titles, SKU, price etc.) to DIBS. 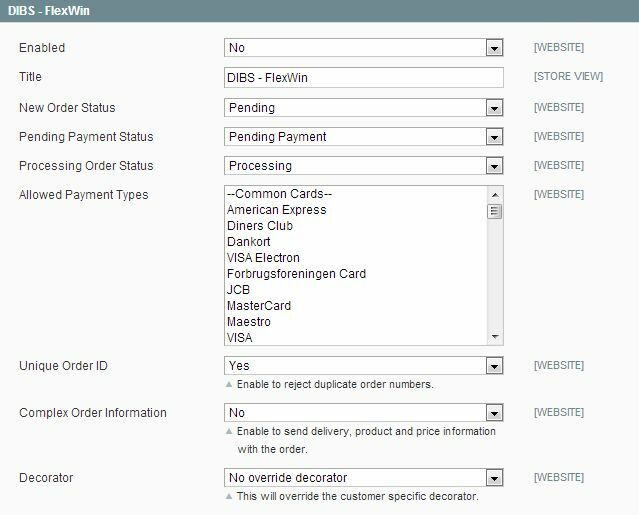 The Decorator option is a theme option for styling the payment form. All three payment methods support a capture and refund workflow. Capture payments by creating the invoice in Magento. Go to Sales > Orders and select an order. Click 'Invoice' and choose 'Capture Online'. This will attempt to capture the payment through DIBS. Refund payments by going to Sales > Invoices (not Orders). Select an invoice you wish to refund. Click 'Credit Memo' and select 'Refund Online'. This will attempt to refund the payment through DIBS.